The KL Monorail (a.k.a. Monorel) is a short and elevated monorail system that connecting destinations within the city centre along 11 stations (8.6km). 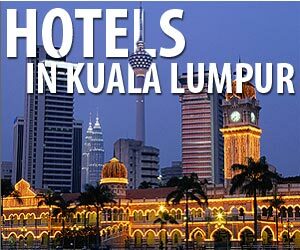 It is also offers good views over of downtown Kuala Lumpur. The Sultan Abdul Aziz Shah Airport is KL's secondary airport housing airlines such as Malindo Air and Firefly. After the opening of the 2 LRT lines in 1998 and the Monorail in 2003, the long overdue first MRT line was opened in 2017. KLIA 2 is new low-cost terminal of the KLIA airport and has replaced LCCT terminal in May 2014. The terminal has been torn down in early 2012! Smaller bus station in Imbi (just off Bukit Bintang) for some luxury buses to Singapore and buses to Genting Highlands. There are also a few other ticket counters of other companies for buses that leave from Puduraya.